Book reviews and thoughts. Sharing my reviews of the books I love to read. Every year, at New Year, I make some resolutions. Things that I want to do in the following year, things that I want to change. This year I was a little more vague than I have been in previous years, knowing, as I do, that it's rare for me to actually achieve all of these big plans. I've already started to think about what I'd like to achieve in the next year and it occured to me that I didn't really need to wait until the New Year. Of course, I don't in any case, you can decide that you're going to do something at any point, but, more importantly, a birthday is the start of your own personal New Year, and seeing as mine was two days ago, this seems to be as good a time as any. teenager I had a five year diary that I wrote in every day, religiously, for, well, five years. After that I had A5 sized, day to a page diaries that I filled with my hopes and dreams. As time passed though, I became less good at keeping them, days became weeks and blank pages opened up. It's some years now since I kept a diary. This one is a little different though, each page is headed with a question and each year you answer it, seeing how your thoughts change over time. On the first entry the question was about your biggest dream, which tied in quite well with my recent thoughts about what I want to achieve in the next year or so. I have been talking for along time now about writing and although I've made some movement in that direction, I still have a long way to go, but it remains a goal. I've notes jotted down, ideas started, my main problem isn't a lack of inspiration, but the ability to focus on one single story long enough to get it written down. I need to keep on with that. Something that did occur to me though, was that I used to write letters, lots of them. I can't remember now the last time I wrote anyone a letter, which is a bit sad really. I thought, along with my attempts to actually get somewhere with my first book and writing a diary again daily, I perhaps also ought to start writing letters again. I did wonder about trying to write one a week, or perhaps one a month, but they seemed either too frequent to keep up, or not quite frequent enough. I'm going to aim for one every two weeks and see how I go. I think I shall find some nice writing paper and envelopes and go from there. Once I get started with the write idea, who knows where it shall lead. After reading the first of the Nell Sweeney mystery books the other day, (you can see my review here) I couldn't resist moving onto the second in the series. I didn't go straight into it, but I'm not reviewing every book I read at the moment, so it is the next one that you are going to hear about. 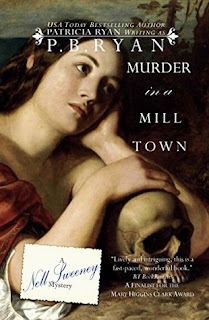 Murder in a Mill Town picks up some months after the end of Still Life with Murder, and Nell hasn't seen Will since. The story opens with Nell in her governess role, playing the Mad Hatter's tea party from Alice in Wonderland with Gracie. Not only does this show Nell in the position that she holds in the Hewitt household, but it also gives Gracie the opportunity to proclaim 'How dweadfully savage' something is, with great comic timing, a little further into the story. Nell is called downstairs to listen to the plight of a couple who's daughter is missing. She had been working at the Hewitt family Mill, run by the third of the Hewitt son's, Harry. Having already appealed to him for help and getting nowhere, they have now turned to his mother, Viola, for assistance. Nell finds herself sent off on an investigation for a second time, to attempt to find out what has happened to the missing girl. Before long she runs into Will again and the two of them begin to investigate together, particularly when it becomes clear that Will's younger brother, Harry, is caught up in the affair one way or another. In the first book we learnt a little of Will's past, his experiences during the civil war and how he came to be an opium addict and a gambler. In Murder in a Mill Town we are shown much more of Nell's back story and her life prior to becoming part of the Hewitt's household. Nell and Will become closer and work well together, but as the past is revealed their growing relationship comes under increasing strain. The first time I read this book I didn't work out who done it and the end came as a surprise, that may of course have just been me being a bit slow, but either way, I did think that the mystery worked and didn't leave big unanswered questions. I have already mentioned that I love this whole series, so it will come as no surprise that I love this book and highly recommend it, (but read Still Life with Murder first). By the end of Murder in Mill Town, you may well find that you're a good way to being in love with Will, if you're the type that does fall for fictional characters, I certainly was. I'll try to hold off reading the third in the series, for a few days at least. Cloth nappy advisor and retailer. Owner of Nappyneedz cloth nappies and Ecobots pure cotton nappies. Offering info to New Zealand parents about cloth nappy use. Voracious reader, particularly of crime novels. Aspiring novelist, first book a work in progress. Mum to four crazy children. Share book reviews and ratings with Kelly-jo, and even join a book club on Goodreads.